Pssst! Wanna buy a dance floor? So who’s bought them? “I have,” he says. Ah the famous ‘flaming torches’ in reception at Baldwin’s Omega. Uplit strips of cloth used to flicker like flames. I used to joke they only operated when Mr B – big boss David Baldwin – was in the building. But they will flicker no more here. The Omega is shortly to be demolished for housing and it’s having a closing down sale. Everything must go. Jamie, the Operations Manager, is keeping an eye on things during the sale, which runs until Sunday. He and head chef Steve Roebuck will be opening a new venture, the Omega at Abbeydale, with the old ethos at Abbeydale Sports Club in September and those torches will be used somewhere. We wander past tables stacked with candles, vases, wine glasses, crockery, chairs and veteran kitchen equipment and into the ballroom with its sprung floor. Several generations of dancers tripped the light fantastic here at functions and dinners, whisked their partners round the floor on salmon and strawberry nights or limboed under the bar on Caribbean evenings. I pass on that one but do buy a candle setting for a fiver. That’s not thinking quite out of the box as some people. They’ve already sold basins from the ladies and one of the urinals from the gents, which once won David and his wife Pauline a Loo of the Year Award. I came down for The Star and we got a saucy picture of him pretending to take a pee. Just in case you were wondering, the Baldwin’s Omega sign on Psalter Lane is not for sale. They plan to take it to their home in Spain. There are memories all around. The wooden lectern on which there used to be a copy of The Star or seat plans is for sale at £45. Pauline Baldwin is in the office for very possibly the last time and in reflective mood. She’d expected a rush but perhaps people will be coming later. Will she be sad now it’s all over – some 37 years of company and works’ dinners, social shindigs, Christmas parties, lunches, pop up restaurant nights and private parties? “I won’t miss the admin but I’ll be like a fish out of water,” she says. The new venture belongs to Jamie and Steve, who will take with them head waitress Angela Jackson, but doubtless the Baldwins will still be around to offer advice. Indeed Mr B plans to take a seat at the bar at the new place. I look forwards to seeing him there. *The sale runs until this Sunday. Another in an occasional series on famous local restaurants and restaurateurs. HE called himself the Talking Menu, I called him the Human Meatball. Pepe Scime’s reaction was to scratch his armpits in his native Sicilian gesture of disgust. But he forgave me. With some restaurants the personality of the chef or owner is as important as the food and so it was with Pepe’s of South Road, Walkley, Sheffield, during the Eighties and early Nineties. There was no menu, just a blackboard, and the diminutive Pepe would talk his customers through the classics, regional specialities and, sometimes, his own inventions, usually with a gag. The meatballs, he’d say, came from Liptons or, when that name faded from the High Street, from Netto. And he’d scratch an armpit. Then he’d disappear downstairs to the kitchen leaving the dining room in the charge of his wife Pam. The kitchen was a fascinating place. Here Pepe made his own Italian sausages or air-dried his hams in the misty Walkley air long before it became fashionable. Pepe Scime was a character. For a year or two he sponsored the mammoth Manor Operatic Christmas panto at the City Hall, with giveaways for the children in Netto carrier bags. I met Pepe at the high point of his career. He’d begun at a pizza parlour in the town centre (now Mama’s & Leonies) where he had met Pam. “She had the chef’s special,” he’d joke. “And look what I finished up with,” she shot back. They took over what had been Roy’s Bistro, another famous institution, in 1983. He gave me a ring early on in my reviewing career, correctly guessing there might be a few things I needed to know about Italian cooking. Did I know, he said, that some places passed off expensive calves liver by marinating lambs’ in milk? I joined him for the day, which began with an early morning sambucca before a visit to the wholesale market, prepping in the afternoon, watching the cooking in the evening and drunkenly trying to make gnocchi, ending 18 hours later. As I was leaning more crazily than the tower of Pisa my wife was called to take me home. Pepe and Pam sold up in 1993 to Vito Ciarialo, his chef and latterly partner for the previous 18 months. Vito renamed the place after himself, made it his own and is still there 25 years on this year. The couple went to Tickhill to run the I Paparazzi bar in the Red Lion but after a while returned to the city to take over Mamma Mia Pepe on Langsett Road. They were there for nine years. He was then 60 and feeing the long years on his feet in the kitchen. He had taken his brother’s advice, an old Sicilian proverb: “Don’t squeeze the lemon twice.” At his retirement party my wife gave him a tin of meatballs. The couple retired to Spain and we lost touch but Pepe and Pam wrote their own chapter in Sheffield’s culinary history. Sheffield fishcake – as seen on BBC radio! WOULD I, asked the BBC chappie down the phone, like to come on air to talk about the Sheffield fishcake? It is a local speciality I have long championed although I have never made one myself. Eaten them, yes. There was just one catch. Could I be in the studio by 7.10am? They’d have a fishcake ready. It was one they’d had made earlier. Bleary-eyed I was ushered into the studio to greet bequiffed and fresh-as-a-daisy presenter Owain Wyn Evans, usually Look North’s weatherman but standing in for Radio Sheffield’s regular on the morning show, Toby Foster. He had the fishcake in his hand. “It’s big,” he said. “No, that’s the breadcake (bun, roll, bap, buttie or stottie to people not from Sheffield), the fishcake is inside,” I said gently. Owain is Welsh. You can tell that from his name. I am a quarter Welsh on my mother’s side but we didn’t get time for any yaki da’s. He nibbled it, cold, and liked it. I couldn’t do that on the radio. I’d also brought along some oatcakes, my homemade Sheffield Relish and a snappy soundbite. Owain chewed on an oatcake. He liked that, too. Then he sprinkled a little Relish on his palm, licked it and said “That’s lovely!” Really? ”Yes.” I very nearly gave him the bottle but didn’t. But he’d had a free breakfast and he could keep the oatcakes. “That was great,” said a BBC chappie as I was ushered out of the studio. They always say you were wonderful but I never got to use my soundbite. The next day I got a call from Ailsa, producer of Georgey Spanswick’s evening radio show, broadcast across all the BBC’s local stations. She’d heard the bit about fishcakes and of course it sounded wonderful. So could I talk to Georgey over the phone? I realise I am suddenly the go-to man for Sheffield fishcakes. I suppose there are worse things to be known for. It goes well. I rabbit on about fishcakes, then Derbyshire oatcakes, tomato dip and polony sausage, slip in a joke or two and a few free plugs and namechecks. Georgey lets me talk and it must be slowly dawning on the nation, or at least that part of it which listens to local radio, that there is more to Sheffield than steel and an insane council cutting down the city’s trees. “That was great,” said a BBC chappie ringing off. And I forgot the soundbite. So fings ain’t wot they used t’be, Dave? Napoleons was sold this week for ‘considerably less’ than the £850,000 asking price, according to The Star. It is not known what the plans are. BIGGEST news this week was that Dave Allen was closing Napoleons casino and restaurant on Ecclesall Road this Sunday after 42 years. Since he already has another at Owlerton (plus a dog track and restaurant) and four other casinos in Yorkshire and London that might have been it: sad but a business decision. But what set the greyhound among the pigeons was his parting shot: “Time moves on and Ecclesall Road is not what it used to be.” Coming from one of Yorkshire’s wealthiest men and certainly its wealthiest pigeon fancier (you can currently buy a DVD online for £9.99 entitled Dave Allen: The Living Legend filmed with a trip around his loft), it seemed a dismissal of one of Sheffield’s liveliest arteries. He cited the imminent closure of Baldwin’s Omega, which would affect trade, as patrons would no longer be following on their entertainment at his tables. However, while the banqueting trade is certainly not what it used to be, the main reason David and Pauline Baldwin are selling is because of retirement and the chance of a nest egg. It would have been handy to know what David Easton Dey Allen meant by that remark. But, typical Dave, he’d said his piece, in a statement released on his website, and was not taking calls from journalists. The Star ran with the story on Wednesday and I bought the weekly Sheffield Telegraph the following day, which splashed it all over the front page. But I cannot have been the only one disappointed to find this was simply a repeat of the daily’s story with just two quotes, one from an existing trader and one yet to open. No background, no analysis: a chance missed. I mention it on this blog for Dave, who heads A&S Leisure, is pretty good on the food front. I am not a gambling man but on the one occasion I have eaten at the Ecclesall Road casino I was impressed by the quality and value. The same goes for the Panorama restaurant at Owlerton although my review which included an obvious joke about eating expired dogs met with a furious response. It might have been a bad joke, it was also bad timing. Co-incidentally a leading Chinese restaurant had put out a Press statement dispelling a rumour it was serving up greyhound stir-fry. Coupled with the news that Ecclesall Road was closing came details that a 500-seater banqueting suite was planned for Owlerton (presumably hoping to pick up the Baldwin’s business) and another casino, bar and restaurant opening in Manchester. With such big expenditure planned it made sound business sense to axe Eccy Road, a prime redevelopment site. So why the swipe at Ecclesall Road in general? It can hardly have escaped Dave’s notice that the road is considerably different than from when he opened in the Seventies. Then it was dubbed Sheffield’s Golden Mile and the ‘Bond Street of the North’ on account of the swanky, pricy boutiques: Alicia Kite, Paces, Posh, Elizabeth’s, Robert Brady and hairdressers such as Andrew Hook’s La Coupe. There were just three pubs and precious few restaurants beyond the Ashoka and Ron Barton’s Uncle Sam’s. Since then the number of pubs, bars and restaurants has multiplied beyond measure. Ecclesall Road is busier, and livelier and while trade might be difficult the ‘offer’ to consumers is wider and more comprehensive than it ever was. SO you’ve strained all the gin off your sloe berries and those bottles look a beautiful colour. But what are you going to do with all those leftover berries? Get the worms drunk? It’s notoriously difficult to squeeze the last vestiges of gin from hard blackthorn but the alcohol is still in there. And as the watchword of this blog is Waste Not, Want Not, they are crying out to be put to more good use. 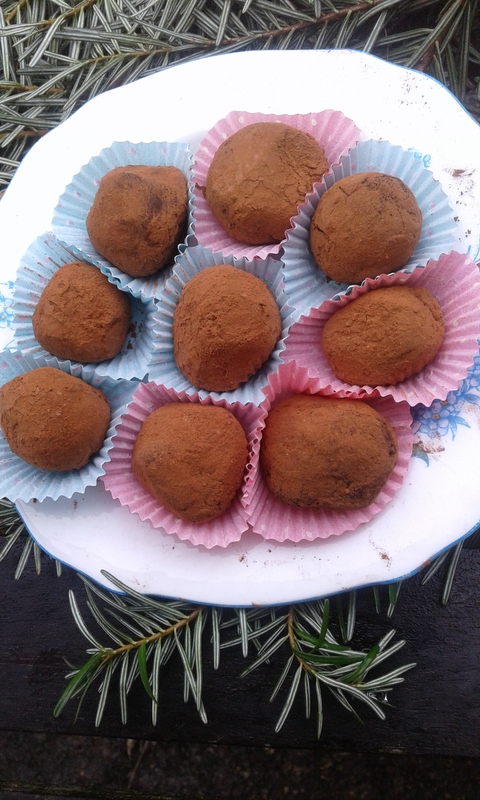 As it’s Christmas, why not sloe gin truffles? There is a small problem of getting the pulp off the small hard stones but I used a Mouli and got satisfying amounts of berry pulp through. You only need 75g for this recipe so freeze the rest for when you have time to make a boozy jam, jelly or chutney in the new year. This recipe makes around 15 good sized truffles. Slowly melt the butter and cream together in a pan, stirring slowly. Let it just come to the boil for a minute then remove from the heat and stir in the chocolate, bits at a time, and stir until melted in. You may need to return the pan to the heat from time to time, still stirring. When all the chocolate is melted, thoroughly stir in the pulp and a little bit of your sloe gin. Pour onto a Swiss roll tin, let it set then put in the fridge to firm up for a couple of hours. Then sprinkle the cocoa onto a plate and on your hands and scrape up spoonfuls of chocolate mixture and roll into balls. Cover with cocoa powder and put into little paper cases. The truffles soften quite quickly so you may have to put the tray back in the fridge halfway through for the mix to firm up. Keep them in the fridge. They should last for a week if you’re planning ahead. They taste very good with a glass of sloe gin but be warned, they are very rich. It goes without saying you can use any other fruit you have used to infuse your gin or vodka.